Slow Breathing Has A Direct Effect On Tranquility--At Least In Mice : Shots - Health News A cluster of neurons connects breathing and emotion centers in mouse brains, researchers say. If this turns out to be true in humans, it could explain how controlled breathing calms the mind. 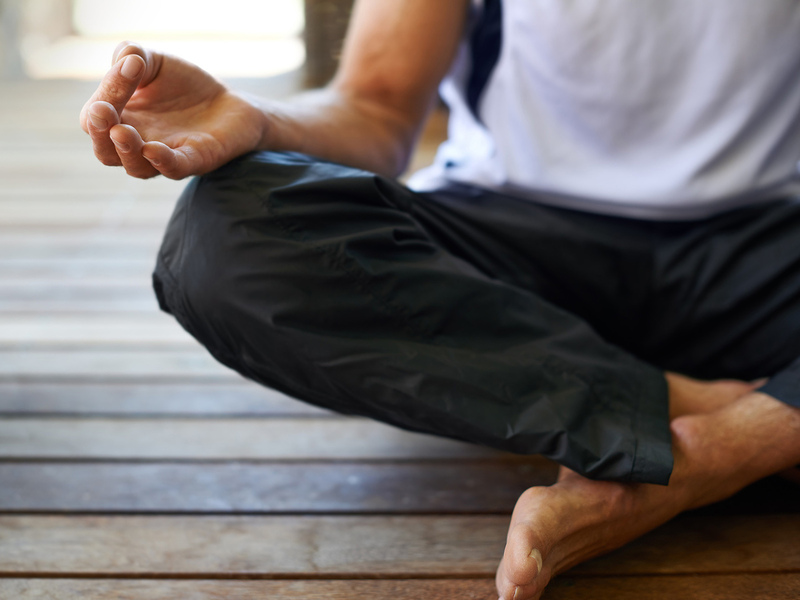 It doesn't require yoga or meditation to destress by taking long, slow breaths. Controlled breathing like this can combat anxiety, panic attacks and depression. It's one reason so many people experience tranquility after meditation or a pranayama yoga class. How exactly the brain associates slow breathing with calmness and quick breathing with nervousness, though, has been a mystery. Now, researchers say they've found the link, at least in mice. If that mouse pathway works the same way in humans, it would explain why we get so chilled out after slowing down our breathing. To figure this out, researchers first divvied up the 3,000 neurons in the breathing pacemaker by their genetics, as neurons with similar genes might have similar roles in the brain. That's how they zeroed in on that 175. The next challenge was to uncover their function. Sometimes the best way to see what something does is to see what happens when it's gone, so the researchers inactivated those neurons. To do so, they first genetically engineered mice to have receptors to a toxin only on the neurons of interest. That let them kill off only those neurons by injecting the mice with the toxin, which is made by bacteria called diphtheria. Diphtheria can cause serious respiratory illness in humans, but doesn't normally affect mice. In the engineered mice, though, the toxin could kill the cells it attached to: the 175 neurons. That way, those neurons were knocked out and the rest were left intact and fully functional, as the researchers explain in their study, published Thursday in Science. Finally, researchers looked at how the loss of those neurons affected the breathing and behavior of the mice by putting them in a pressurized chamber that's sensitive enough to measure the size and frequency of even the tiniest mouse breath. "We expected that [inactivating the neurons] might completely eliminate or dramatically alter the breathing pattern of the mice," like making them gasp or cough, says Mark Krasnow, a professor of biochemistry at Stanford University School of Medicine and an author on the study. But there wasn't a change in the breathing pattern. For a few days, the researchers thought they had made a mistake in their experiment and failed altogether. After retesting the mice in the chamber under various conditions—during sleep, with elevated carbon dioxide levels and more — Krasnow finally realized that "there was a change in these animals," he says. "They had become chill. Mellow fellows." Before losing the 175 neurons, the mice did in the chamber "what mice love to do," Krasnow says: explore and sniff. After the neurons were gone, the mice spent much more time engaging in classic calm mouse behavior, including relaxing and grooming themselves. Upon closer examination, they also breathed more slowly. That chill behavior reminded Kevin Yackle, lead author on the study and Sandler Fellow at the University of California San Francisco, of animals—humans included—who had lost function in the arousal center of the brain that induces alertness and panic. They too were mellow fellows, giving Yackle the idea that the arousal centers in the brains of his mice weren't getting any input from the breathing centers, so they didn't act alert. At the same time, those breathing centers weren't getting any panic or alert messages from the arousal center, so their breathing stayed slow. The connection between the two brain areas, the 175 neurons, had been removed. And that connection is key, Krasnow says. "If you're choking, or if you have a plastic bag that's suffocating you, you better be awake and alert and dealing with that crisis because there is nothing more serious than a disruption to your breathing pattern." Krasnow and Yackle think that if this mouse pathway also exists in humans, it could be useful in treating people with anxiety, where the pathway may be overactivated. Controlled breathing or medication could help lower activity in the pathway, he speculates, by lowering feelings of panic and the rate of breath. Krasnow notes that human brains have breathing and arousal centers, and that he's hopeful for similarity between species. "The two-way connection between emotion and breathing is important and puzzling," Robert Banzett, an associate professor of medicine at Harvard Medical School told Shots in an email. Banzett didn't work on the new study. "It's a long way from this to human emotion and behavior, but one must start someplace." Alicia Meuret, an associate professor of psychology at Southern Methodist University who also wasn't involved in the study, wasn't sure if what the authors described as calm mouse behavior could be described as such. "It's hard to determine what calm behavior is [in mice]," Meuret says. "We can see their behavior, but we don't know what effect the loss of neurons has on their emotions." Banzett echoed that concern, noting the authors inferred emotion because "they equate the increase in grooming behavior with the emotional state of calmness." There's plenty of peer-reviewed research out there to show that the slow, deep, controlled breathing done in yoga and meditation does help alleviate anxiety and depression. The authors say that identifying the human neurons that connect breathing and arousal centers is the next step for their research. "This connection between breathing and higher-order brain function is an idea that's been around for millennia," Krasnow says, "at least dating back to the time of development of pranayama yoga practices. The way that pranayama yoga and these other approaches try to calm the mind is to simply take control of your breathing by taking... slow... regular... breaths." With this in mind, Krasnow and his colleagues have named the 175 neurons and their corresponding pathway after the ancient practice: the pranayama neurons and pranayama pathway.